Spring has finally arrived! Sitting outside with your loved ones (or by yourself and just enjoying the peace & quiet), drinking coffee, eating cake... Those are basically my favourite things to do as soon as it gets hotter than 18°C in Germany. And somehow I always crave fruity cakes in spring, preferably rhubarb and any kind of berry. 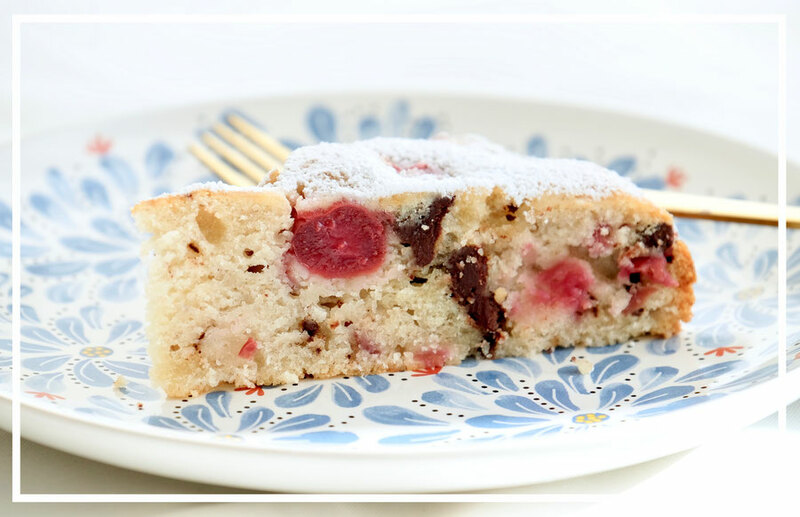 But when I decided to make this cake last month, it was a sunday and no fresh fruit, eggs or open store in sight - which is where this amazingly easy recipe for vegan cherry & chocolate cake comes in! This is not the kind of vegan cake that requires you to go to 3 different stores for the ingredients. You'll most likely have all of these in your pantry already, just like I did (cakemergencies are a thing, y'all)! I found the recipe on Pinterest and tweaked it a little bit, adding chocolate (because it makes everything better) and decreasing the amount of sugar. 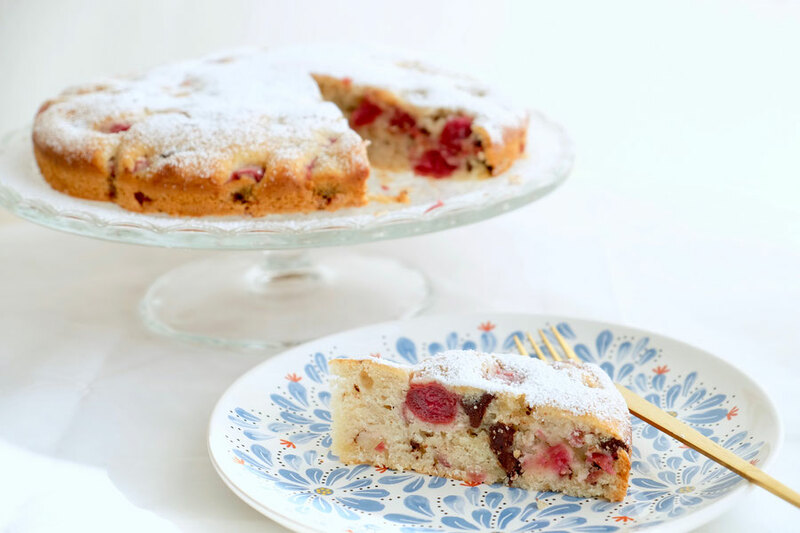 The cake is incredibly moist, takes about 10 minutes come together and the cherries add that hint of freshness without overpowering the subtle vanilla flavor. Dust some powdered sugar and this baby is ready to be devoured. And trust me, no one will even suspect that this cake is vegan. I've made it several times since and everyone loved it! This is definitely a new staple of mine and I can't wait to try the recipe with other fresh fruit or maybe even white chocolate! Let the cherries defrost if necessary and drain in a sieve. Preheat the oven to 180°C and line a springform pan with parchment paper. Combine all the dry ingredients in a bowl, whisk them together. Add all the liquid ingredients and use a normal whisk to combine. Mix only until the flour is no longer visible; don't overmix! A few lumps are totally fine. If you overmix this batter, the cake might not rise. Fold in the cherries and the chocolate. Transfer the batter into the pan, level it with a spatula and bake the cake for 30-40 minutes, testing the doneness after about 30. Let the cake cool in the pan for about 15 minutes, then transfer it out of the pan and let it cool completely. Dust it with powdered sugar before serving and enjoy!